Our boutique offers UV-free spray tans using the VersaSpa system and our custom-made designer bronzer. You'll love your bold, new look with your choice of a medium, dark, or super dark tan. A spray tan from Suddenly Bronze Boutique will give you the beautiful, natural-looking glow that you've been dreaming of. Our VersaSpa system is a complete spa process that includes primer, bronzer, moisturizer, and fragrance for one affordable price and no additional fees. We spray brides, bridal parties, family members, beauty pageant participants, students, and more. Call and schedule your appointment with us today. 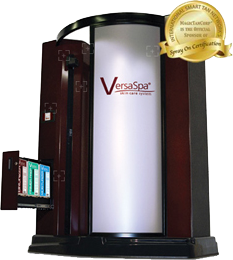 Get the gorgeous, healthy tan that you've been looking for with our innovative VersaSpa spray tanning systems. Our sunless tanning services are perfect for clients that don't have very much time, but still want to look tanned. Call us with any questions or to set up an appointment for your next tanning session. Do you want to be tan but you don't have time for a tanning bed? An airbrush spray tan is perfect for you. First you'll need to shower, exfoliate and shave. Do not apply body lotions, deodorant, makeup or perfume (applying these will hinder your spray tan performing to its fullest expectations). Keep in mind that wearing the proper clothing is important too. When you are ready to come see us for your spray tan, remember to wear or bring loose clothing and easy to slide on footwear, such as sandals or flip flops. Try to avoid tight pants or jeans, sports bras, long sleeves, tights, tennis shoes or boots. Come in and see us, we're here for you! Contact us today to learn more about our tanning salon or to set up your appointment. I have been using this salon for 2 years and have always been happy with my tan! Exceptional service and amazing deals! 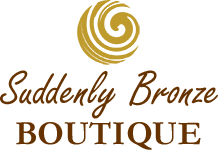 Every member of the Suddenly Bronze Boutique staff is certified in airbrush spray tanning. The bronzing solution that we use is 100% natural and organic, dries quickly, is less sticky, and can be ready in as little as two hours. Our bronzer has been made exclusively for our company and can't be found anywhere else in Tallahassee, Florida, or the rest of the United States. Every spray includes a primer that will help prevent you from flaking, peeling, and looking orange. Our staff is happy to assist you with the selection of your tanning level and products that are right for what you're looking for. We are the proud sponsors of the Florida State University cheerleaders and Golden Girls for our fifth consecutive year.